Please join us Friday, August 7th, 7-10 pm at AHN|VHS, Philadelphia, for the opening of SP Weather Station: Weather Reports, featuring artist projects from January 2008 onwards (details below). The limited edition 2008 SPWS portfolio is now available! Please contact us for info. AHN|VHS presents an exhibition of data interpretive art work for the SP Weather Station, a project of the SP Artist Collective in Long Island City, NY. Co-founded by artists Natalie Campbell and Heidi Neilson in 2007, the SP Weather Station is an interdisciplinary project that collects weather data, and organizes weather-related publications, events, and exhibitions, while maintaining a rooftop weather station. Over the course of 2008, SPWS invited numerous “Guest Interpreters” to create weather reports using its data. As artist participant and co-founder Heidi Neilson states, the project revealed “the infinite possibilities for the interpretation of data, and some of the problems this presents.” The work produced by these artist interpreters ranges from stark to whimsical to utterly chaotic. Artist Michael Geminder created a minimal four word summary of one month’s weather laser cut in cardboard, while Katarina Jerinic created a temporary tattoo for one’s index finger which measures the direction of the wind. In a video and live drawing collaboration by Natalie Campbell, Daniel Larson, Heidi Neilson, Jing Yu, and Liz Zanis, the changes in wind direction over the course of a day are read allowed while the artists attempt to collectively illustrate the rapidly shifting patterns. SPWS has compiled these interpretations into a portfolio which will be on view in the AHN|VHS gallery. Guest Interpreters contributing to the portfolio include Leah Beeferman, Carrie Dashow, Natalie Campbell, Susan G. Campbell, Mike Estabrook, Neil Freeman, Richard Garrison, Michael Geminder, Vandana Jain, Katarina Jerinic, Emily Larned, Daniel Larson, Bridget Lewis, Lize Mogel, Heidi Neilson, Mark Nystrom, Chris Petrone, Sarah Nicole Phillips, Luke Strosnider, Jing Yu and Liz Zanis. SP Weather Station has exhibited at The Queens Museum, Eyebeam, and most recently in Ithaca, NY as participants in the “To Let” exhibition series. 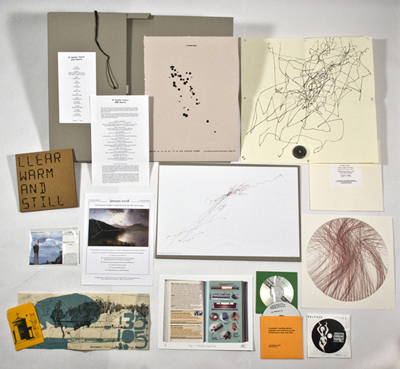 SP Weather Station is a sponsored project of Fractured Atlas, a non-profit arts service organization. About AHN|VHS: Gallery owners Julianne Ahn and Lauren van Haaften-Schick are Philadelphia-based artists and arts professionals. In addition to monthly exhibitions, AHN|VHS features a growing inventory of works on paper and editions in all media in our flat file and on our store shelves. All artwork is available for viewing and for sale in the gallery and at www.ahnvhs.com.